Our herd began in 2010 with the purchase of Money and Izzy (reference doe). The number one reason we have dairy goats is to provide milk for our personal use - including enough to make cheese, yogurt, ice cream, etc. We look for does with the size and strength to kid and produce on a long-term basis. Our does are expected to milk a minimum of ten months out of the year with relatively level lactations. Our ladies are fed alfalfa hay throughout the year, though they receive grain and pellets on the milkstand and enjoy rotational grazing on diverse grasses and weeds when weather permits. They also receive treats such as apples, pumpkins and other garden produce, leaves, spruce and pine boughs and anything else we can find that might tickle their tastebuds. If they're eating, they're most likely producing. A good goat mineral is also provided. Fresh water that's cool in summer and warm in winter is an important component in our livestock care. Buckets are cleaned regularly. We find the does will drink the most right after milking, so that's when the freshest, most-appropriate temperature water is available. Our goats are housed in a draft-free environment, with shade and wind protection also in the corrals. Stalls are cleaned as needed. Though we've sprayed the barn for flies in the past, we've started using fly predators to control those pests. Generally, feet are trimmed every 3-4 weeks. Our goats are expected to be up on their feet grazing or moving around, so we want their feet to support them well and try to never let them get too long. We have sandy soil with few rocks, so their feet don't wear much naturally. Kids get their feet handled from birth, so they're easy to trim. My does often stand in line for foot trimming - and the associated treats. Our herd is vaccinated annually with Covexin 8 (overeating, tetanus and pneumonia) and for CL. (Before vaccinating, our goats had all tested negative for CL and we've never had abscesses, but decided to use the vaccine as a preventative measure.) In 2014, outbreaks of pneumonia in the area caused us to use the nasal vaccine for pastuerella - which worked great with no side effects. We regularly test for CAE, Johnes, brucellosis and Q fever with - so far - negative results. All goats entering the herd are tested prior to coming onto the farm. Star says, "a good head scratch feels great." The scratching pad is a scrub pad from one of those industrial scrubbing machines used in large stores and warehouses. The companies were glad to give us the used pads and the goats adore them. There's a plethora of photos in our photo section. Photo courtesy of Kecskemet Nubians. This photo shows beautiful Cherry in January, 2016. She's still producing about three quarts of milk at day at nine months fresh. Cherry just received her SG designation form the American Dairy Goat Association. SG stands for Superior Genetics. 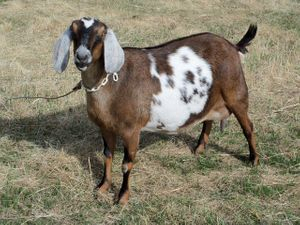 It is awarded to goats for both superior performance as well as strong performance by their offspring. We've always known Cherry was special. Having her of her buck sons go through Linear Appraisal this year confirmed it to the rest of the world. 2016 LA: 90VEEE - Our herd's best ever score! 2018 Lactation: Still in progress. 2016 Lactation: 2,770 pounds of milk in 317 days, 4.34% butterfat (120 pounds), and 3.76% protein (104 pounds). 2015 Lactation: 2450 pounds in 310 days, 4.36% butterfat (107 pounds) and 3.71% protein (91 pounds). Cherry had her milk star in just five months! She's a powerhouse milker. Since Cherry's mother also has a milk star, that makes Cherry a second generation star. 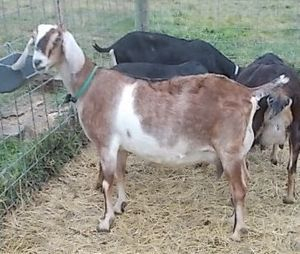 April, 2019 - Cherry is bred to Paco and carrying at least twins according to ultrasound. All doelings are reserved. March 30, 2018 - Cherry delivered Atlas bucklings: two red and white boys. April 6, 2017 - Cherry delivered twins sired by Atlas; two flashy red and white babies - a buckling and doeling. March 27, 2016 - Cherry delivered twin Atlas bucklings - a repeat breeding. These boys are large and in charge. With strong production on both sides of the pedigree, these boys are offered as bucklings on our 2016 Kids page. These will be the first Cherry or Atlas sons available and offer new genetics to North Dakota producers. 2015 - Cherry produced red and white twins sired by Atlas; a lovely strong doeling and our only buckling of the year. Her udder and production is simply amazing. Our linear appraisal remarked about her very good shoulders, nice wide rump and very good back. 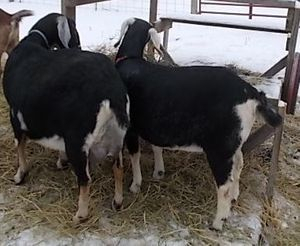 Her doeling "Cherry Sparkles" went to Montana to help restart a dairy herd. 2014 - Cherry kidded in February. This was her second freshening and her quick labor produced twins: a buckling and a doeling. Her doeling "Cherry Pie" is working in another ND herd. 2013 - As a yearling, Cherry was living in Texas and bred to Paco. She had a single doeling "Popcorn" who is working in another ND herd. Cherry immediately went to work producing more than a gallon a day. She's managed to stay in condition while maintaining strong production throughout 12 months of lactation with no concern about heat or cold. Cherry has tons of personality and makes sure she's first at the hay. She carries good condition even in the coldest weather. I'm truly excited about her next batch of kids. April 25, 2015. That just over three quarts of milk waiting to be expelled. Sorry, her head is so out of proportion. Shekel is pictured at 13 months of age in April, 2016. 2016 Lactation (First Freshening as a 13 month old): 1,710 pounds of milk in 291 days, 4.81% butterfat (82 pounds) and 3.99% protein (68 pounds). My beautiful Shekel stole my heart from the very first look with her strong, straight stance and gorgeous head. 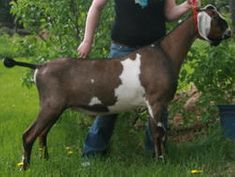 She was part of a set of triplet doelings out of first freshener Rupee and first-time papa Atlas. She and her sisters actually had little udders at birth. Weighing just under five pounds at birth, Shekel eagerly took to the bottle and never refused a meal. A weight tape had her at 115 pounds at seven months of age when she was weaned from the bottle. This great growth is the reason we broke from tradition and bred her to kid at a year of age instead of waiting. 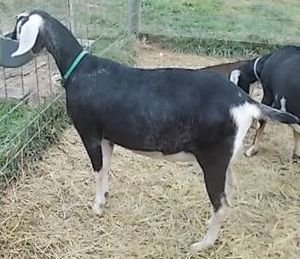 2019 - We are milking Shekel through this year so she is not bred. March 28, 2018 - Shekel delivered her first set of triplets: two doelings and a buckling; all red and white, sired by Paco. She was reluctant to dry up this winter, even with cold temps. I had to work to get her production reduced to the point where I could milk just once a day, midday, when temps were at their warmest. She only dried up on March 9th. I love that strong will to milk. If things go well this year, the plan is to not breed Shekel in the fall and see just how long she'll milk into 2019. April 17, 2017 - Shekel delivered Paco twin bucklings weighing 8.6# and 10.2#. April 17, 2016 - Shekel is doe to deliver Paco kids. We're delighted to repeat this breeding. April, 2016 - Shekel presented us with beautiful twins from Paco - one buckling and a doeling. She delivered on her own with just a little help cleaning kids off from Great Grandma Mony. Dimples is pictured at one year of age in April, 2016. Dimples delivered our set of quadruplets, though one was born dead. She was extremely full of kids and was very uncomfortable throughout her pregnancy. The delivery was very difficult and Dimples could only stand for very short periods afterward. She developed ketosis, but managed a good attitude and slowly we nursed her back to normal activities. Dimples will not be bred for 2019 kidding. Instead, we are milking her as long as she'll produce. 2017 Lactation: 1,929 pounds of milk in 271 days, average 4.51% butterfat (87 pounds) and 3.68% protein (71 pounds). Dimples was dried up early because her pregnancy was really weighing on her. 2016 Lactation (First Freshening as a 12 month old doe): 1,540 pounds of milk in 298 days, 5.14% butterfat (79 pounds) and 3.71% protein (57 pounds). Right after I mailed our DHIR application to ADGA, I went to the barn and Mony was in labor. Dimples and her twin sister were the result. She's extremely quiet in the herd, but makes sure to get her daily dose of affection. Dimples and her sister were eager eaters and grew quickly. At peak, Dimples was drinking three quarts of milk a day. This resulted in what some call "over conditioning" and negatively impacted her LA score. At six months of age, Dimples weighed 110 pounds. 2019 - We are milking Dimples through this year. She will not be bred. March 23, 2018 - Dimples delivered Atlas triplets: two bucklings and a doeling, all black and white. April 13, 2017 - Dimples presented Atlas triplets: two bucklings and a doeling. These kids are stunning. 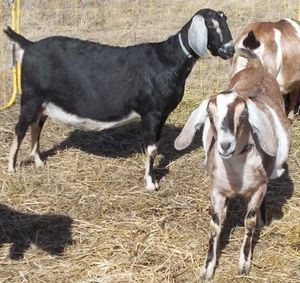 Both bucklings found homes as herd sires for people interested in milk. April 14, 2016 - At just one year and two weeks of age - Dimples delivered triplets sired by Atlas. This little doe was extremely full and the first two bucklings came out backwards and upside down....so they were pulled up and over her back! Just two weeks before delivery, the toll of carrying so many kids started to show on this young doe. Her hind feet began to turn inward. I fed extra calcium and tried to boost her nutrition, but unfortunately, we haven't been able to reverse the damage to her feet. I'll never breed doelings this young again, regardless of their size. Dimples is a sweet, gentle young lady and delightful on the milk stand. 2016 Lactation (as a ten year old doe): 920 pounds of milk in 193 days, 4.36% butterfat (40 pounds), and 3.49 protein (32 pounds). 2015 Lactation: 1090 pounds of milk in 290 days, 4.61% butterfat (50 pounds), and 3.59% protein (39 pounds). Appraisers love Mony's wide front end, body capacity and sturdy structure. She has wonderful udder attachment and is an easy milker. At ten years of age, she still looks great, though she's lost a couple of teeth. We watch her condition carefully. Mony's the exception to our rule of expecting does to milk a full ten months. Instead, she tells us when she's done. It was nine months this year. She carries the genetics for extended lactations (over a year) and passes that on. Mony was our first doe. She came to us six months into her lactation. We were looking for a gentle, experienced doe who would be patient as we learned about goats. Our intention was to build our facilities around her. When we went to pick her up, she met us at the corral gate and allowed me to touch her all over, even picking up her feet while she was loose in the corral. SOLD! I think she was a bit nervous arriving at our house when she couldn't see a barn. Then I squatted down to milk (no milk stand yet) and after three squirts, Mony relaxed. She seemed relieved that we had a clue what to do. Though her personality and milking ability were her most important qualifications for us - we appreciate her quality. She has size, strength, body capacity and a willingness to milk with fabulous udder texture. Mony knows she's the queen and takes her duties seriously watching for predators and teaching the rest of the herd which treats are the tastiest. She received a linear appraisal score of 87 in her first appraisal and that after she'd had a rough delivery and bout of milk fever. We hold group appraisal sessions with several herds coming together and always some are new to LA. Money is the first doe appraised, so the appraiser takes extra time to explain the process and how the measurements and traits should correlate. Miss Mony stands patiently throughout the process. She adores the attention. In 2015, the appraiser praised Mony's "beautifully skulpted eyes." Early June, 2017 - Mony is bred to Atlas - we thought. She fooled us, but that's okay. This old girl is starting to show her age. We've officially retired her. April 14, 2016 - Mony delivered a 10.5# buckling, son of Paco. Mony appears to have recovered and is doing well. This may be her last baby. April 3, 2015 - Mony delivered twin black and white daughters of Paco. (I mailed my application to ADGA to start milk testing, then headed to the barn and Mony was in labor! Do you think she approved of my decision?) They're gorgeous with facial stripes, topknots and long white legs. With that pedigree, they ought to milk heavily. 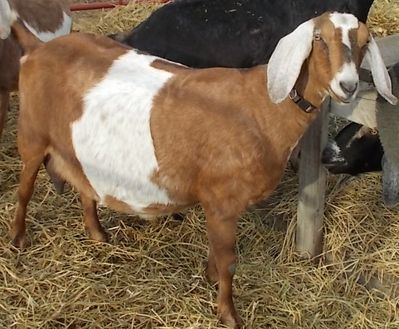 March, 2014 - Mony delivered a single doeling daughter of Dandy. She'd fooled around all day, but nothing was happening. Finally I went to the house to get the milk bucket and finish poultry chores. 30 minutes later I walked into the barn and heard a doeling cry. Apparently Mony wanted to deliver this kid on her own. The kid "Millie" has never been shy about letting us know what she wants. Mony has had a series of daughters in our herd. We love how they carry her reproductive traits, structural strength, easy milking ability and friendly personality. Mony daughters Star (left) and Dimples on February 2, 2016. Star is five years old, almost dry. Dimples is 10 months old. Both are 2.5 months pregnant. Mony daughters Star (left) and Millie on February 20, 2016. Star is five years old, newly dried off and 3 months pregnant. Millie is two years old and a month pregnant for the first time. Izzy came to us as a dry doe after her first freshening. This beautiful lady had wonderful body capacity, strong feet and legs and what a wonderful udder! Unfortunately, Izzy was also a G6S Carrier, as was Charm - the first doe she produced for us. I found a good home for Charm, but decided I would continue to breed and milk Izzy and test offspring before they left our place. It was a dream of mine to someday bred the offspring of Izzy and Money because I thought the combination would be dynamite. 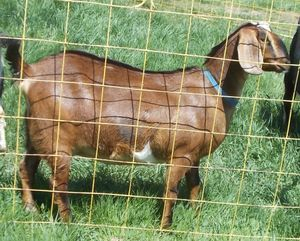 Izzy's son Raj tested Normal for G6S, so I bred him to Money's daughters Penny & Star last fall. The resulting kids are exactly as I pictured - large with wonderful boning, great body capacity, balance and oh, so smooth. I wish I could repeat the breeding, but Raj is already producing on another farm. Izzy passed away in the fall of 2012 due to a rupture of her intestine. I'm thankful there's a doeling in this bunch of kids to keep those Izzy's genetics in my herd. I will always be thankful that Endine took pity on me when I was looking for a second doe and agreed to part with Izzy. She had intended to breed Izzy herself, but decided to trust that I'd do right by her. Izzy may have had a short life with me, but I think it was a happy one. Penny is a new and improved version of her mother. She has that wonderful frame - only with a better body capacity and more correct feet and legs. In the months since her linear appraisal, she has constantly improved. At freshening, she's proven to be an easy milker with extremely well-attached udder. She's still in full winter coat in these photos, but is producing over three quarts a day ( between 7.5 and 8 pounds on my scales). 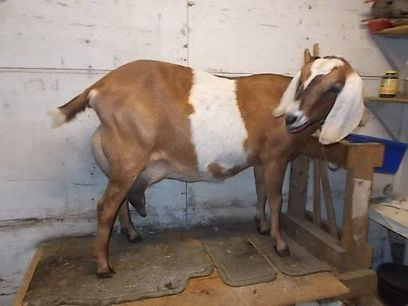 2013 - She produced twins - a buckling (Nibbles) and doeling (Rupee). She's produced over a ton of milk in the first 12 months of lactation and is still being milked in 2014. 4298 pounds of milk in 582 days (19 months), average 4.68% butterfat (201 pounds) and 3.98% protein (171 pounds). For anyone following Representative Luke Simons in the legislature as he supported the Food Freedom bill in 2017, it was Millie's delicious milk that he was drinking on the floor of the ND House of Representatives. This Mony daughter was a singleton. As Mony's due date grew close, I was anxiously watching, since Mony usually has triplets who tend to be tangled and need assistance to greet the world. On the day of Millie's birth, Mony was restless, and I stayed close. I left the barn for 30 minutes prior to milking; only to hear a kid talking when I re-entered the barn. I think Mony wanted to do this on her own. Millie was almost standing and ready for her first drink of lovely "Mony Honey" (milk). Since we have limited barn room, my friend Endine and her family took Millie into their barn to run with other kids. Millie demanded attention and quickly took the lead greeting anyone entering the barn. She's sweet, mischievous, and an impressive young doeling that combines good things from both her parents. If you come visit the barn, you won't have to look for Millie....she'll find you. April 12, 2018 - Millie delivered Atlas kids. Sadly, it was a very difficult delivery that ended up at the vet's office. She suffered a tear in her uterus and had to be euthanised. One very special buckling survived. 2017 - No kids so we kept milking her through. What a joy to have milk the entire year! June, 2016 - Millie presented us with triplet Atlas kids: two bucklings and a large doeling (Divy). Divy is retained in the herd.